This is the first of Mr. Pryke’s books I have read — probably because it’s not the sort I usually prefer. So I did not expect to enjoy it as much as I did. I tend toward mysteries, but this author’s writing style makes up for it being a different genre. His style is nearly as poetic as Keats’. His prose fits the time and the people that inhabit the pages. We join Keats as his career is in its beginnings, as his confidence is faltering, and as he’s struggling to find his way. In this book, chapters alternate between Keats’ thoughts as he waits, quarantined, aboard a ship in the Bay of Naples, and his fiance’s pinings, left in Hampstead to worry about him. Both have much time to delve deep. And Mr. Pryke does a stellar job of giving voice to both Keats and fiance Fanny, such that it reads more like a novel. Beautifully rendered. And definitely recommended. Part biography, part history, part literary commentary and part tragic love story, this is an account of John Keats’ poetic rise to fame and the doomed relationship between the poet and his fiancée. In late Autumn 1820, John Keats, seriously ill with consumption, or tuberculosis, set sail for Italy in the hope that the warmer climate would be beneficial to his health. After almost five weeks battling through violent storms and heavy seas, Keats and his traveling companion, the artist Joseph Severn, arrived in the Bay of Naples on October 21st 1820. But they had sailed from London at a time of plague in the English capital, and the Neapolitan authorities, aware of that fact, imposed a strict ten day quarantine on crew and passengers, preventing anyone from going ashore. Those ten days’ quarantine and John Keats’ frame of mind are one timescale for one half of this narrative – ten days in which Keats looks back on his life, reflects on his development as a poet, and tries to put his troubled thoughts into some sort of order. However, one topic is taboo – he denies himself any thought of Fanny Brawne, his young fiancée, and cannot bring himself to mention her name, for fear that it would break his heart and destroy him utterly. Another, longer timescale of six weeks, and a second setting, follows Fanny Brawne, left behind in the Hampstead house she shared briefly with Keats. There, she feels abandoned, utterly alone and at odds with Keats’ friends. Above all, she is grieving her loss, and for her, the house is full of ghosts and painful memories, but she is expected to wait patiently for news of her fiancé. For the last 200 years, Fanny Brawne has been regarded as a weak, timid girl of little worth. This book takes a different view – her pages give her a voice and explore her thoughts and feelings – it puts her on an almost equal footing with Keats and helps explain the intensity of the relationship the young lovers shared. The book makes use of Keats’ poetry and letters and is written in first person throughout, so as to give greater poignancy and insight into the thoughts and feelings of the two main characters. The sections of the book are headed by the 22 cards of the major arcana of the Tarot pack and alternate between Keats and Fanny Brawne – sometimes the sections complement each other, sometimes they contrast and clash. Above all, the book offers a new perspective on Keats and his poetry. It portrays him as a young man, uncertain of his talents, aware of his limited time, but responding to an inner voice that is calling him, like Endymion, to be the “youth elect” for his generation, the chosen one who must undertake the quest, the hero who must enter the dark regions of the psyche and retrieve the light for all of us. He is the Hermetic hero whose task is to record this quest in his verse, so we can all follow the route he has taken. He is the young man who must dis-cover the light of true love in this sad world of darkness. This is the first of Mr. Pryke’s books I have read — probably because it’s not the sort I usually prefer. So I did not expect to enjoy it as much as I did. I tend toward mysteries, but this author’s writing style makes up for it being a different genre. His style is nearly as poetic as Keats’. His prose fits the time and the people that inhabit the pages.We join Keats as his career is in its beginnings, as his confidence is faltering, and as he’s struggling to find his way. In this book, chapters alternate between Keats’ thoughts as he waits, quarantined, aboard a ship in the Bay of Naples, and his fiance’s pinings, left in Hampstead to worry about him. Both have much time to delve deep. And Mr. Pryke does a stellar job of giving voice to both Keats and fiance Fanny, such that it reads more like a novel. Beautifully rendered. And definitely recommended. What a pleasant surprise this book is! Expecting a scholarly look at the last days of poet John Keats, it was a real treat to discover that the work is not only informative but highly entertaining. One could almost classify it as a historical novel, what with the character development and insight into Keats’ character and place in British Literature. What was most pleasing in Mr. Pryke’s work is his ability to give a “voice” to Fanny Brawne, heretofore a forgotten, obscure, and uncredited force behind the genius of Keats. In this book she steps out of the shadows and becomes vibrantly alive to the reader. This ex-English major had a good time with this book, recalling forgotten poetry and researching the mythology so prevalent in Keats’ work along the way. This work was a pleasure to read and is highly recommended. This is a book that shouldn’t work, but does and does in a very clever and moving way. John Keats is one of my great heroes, and his poetry is never very far from my side. I have read many biographies of Keats, and this book is up there with the best of them. It takes place over the ten days that Keats was stuck in quarantine in the Bay of Naples, and has Keats looking back on his life and poetry. Alternate chapters cover Fanny Brawne’s thoughts over the same period. It also explains a lot of Keats’ poetry, and philosophy, and what it means. A greatly moving story that is told with “beauty and truth”. It also helps to you to understand the last great journey, death, and how not to fear it. This book is an Ode to Keats. It is the biography of the poet written in alternative narrative. Packed with incidents, familiar and unfamiliar, from the poet’s life, the plot revolves around the narratives of John Keats and his young fiancée Fanny Brawne. Pryke’s knowledge of Keats is immaculate; he charts Keats’s life, poetry and struggles in documentary detail. 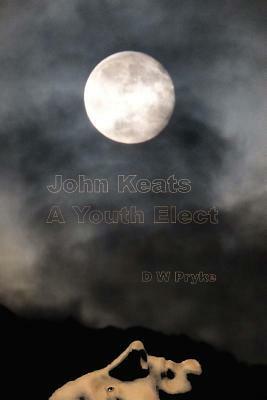 Unlike other biographical novels, “John Keats – a Youth Elect” carries the author’s research and study of the poet like a dream. The narrative is heart-wrenching in places and the reader agonises over the poet’s fate and that of his fiancée. The author has pulled off the dual narrative with great panache. The book is also an excellent educational resource. 5.0 out of 5 stars Such a novel way to write a biography! Such a novel way to write a biography – from the point of view of the subjects. Mr Pryke has closely studied John Keats and his fiancee and unlocks the troubled hearts of both with empathy and compassion. We are given a far deeper understanding of the inner promptings and spiritual aspirations which gave rise to Keats’ poetry, written in prose which seeks to reflect Keats’ own style. I highly recommend this book to all lovers of Keats. An interesting and enjoyable approach to writing about such an iconic literary figure. Well developed characterisation involves the reader from start to finish in a slowly developing psychoanalytical journey. There is much opportunity within the vivid narratives for the reader to consider the issues, concerns and motivations of the voices and to see the links with Keats’ writing, particularly his poetry. This book returned me to Keats. His youthful genius, his sensitivity, his era so alien yet so intriguing and his tragedy, all are here. It had been a while since blowing the dust from our fox-papered edition of his complete works, to just sit and enjoy, and ‘John Keats, a youth elect’ inspired us to do this. A fresh, full tribute to a favorite Romantic.